Happy Friday! 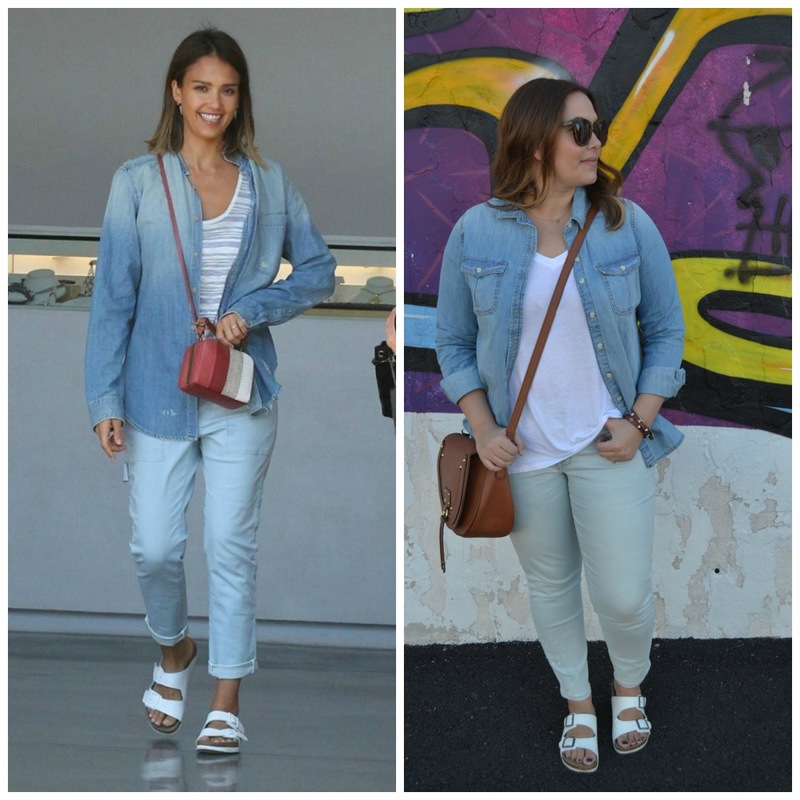 This week’s Hollywood to Housewife is a super casual look from Jessica Alba. Although I love it on her, I wasn’t 100% sold on it on me….I kind of felt like a mom in it at first. I know-I am a Mom. But anyone who is a Mom can probably relate to my thought. Although I am a Mom, I don’t want to look like a typical Mom. Sounds weird I am sure, but whatever. The more I wore it though, the more comfortable and less “mom” I felt in it-you really can’t go wrong with a basic chambray. I would go far enough to say it is a closet staple- if you don’t own one, you need to! You can find them in various washes, and prices-they are quite easy to find! Pairing denim on denim can be kind of tricky sometimes. One thing you have to make sure (really, the only thing) is that the washes are different shades. Pairing a denim top and bottom that are the same shade just doesn’t look good together (in my opinion). I prefer a super light wash (like my jeans) and a medium wash. That’s just a personal preference! In these pictures my jeans have a super light greenish tint to them-they aren’t green. They are a very light wash. I think it was just the lighting. But I love how they look with the medium wash of my chambray! Previous Post Mommy in Heels on You Tube-Need Your Input!